Math teachers work in both private and public schools. Math teachers instruct middle and high school students in classes such as algebra, geometry, trigonometry and calculus. 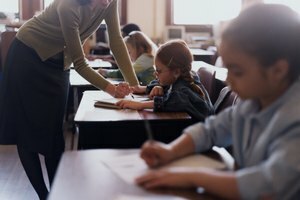 They are responsible for planning lessons, teaching students in whole groups and small groups, creating and administering assessments, grading assignments, preparing students for state-mandated standardized tests and communicating with families regarding student progress. They also supervise students and monitor classroom behaviors. Math teachers must have a bachelor's degree and a teaching license to get started. Most college students complete general education coursework during their first two years of college. These classes typically include subjects such as mathematics, English language composition, science, humanities, fine arts, government, history and elective classes that apply toward a major. Although colleges and universities offer these introductory courses, some students choose to complete these classes at the community college level. Many potential math teachers earn a degree in mathematics before enrolling in an educator program. Some, however, earn dual majors in education and mathematics while others major in education with a concentration in mathematics. Undergraduate students take classes such as discrete mathematics, statistics, geometry, algebra and calculus, along with coursework in methods of teaching mathematics. A future teacher must spend at least one semester working in a classroom under the supervision of an experienced instructor to satisfy student teaching requirements. The candidate must take and pass one or more rigorous examinations that evaluates her knowledge of mathematical subject areas and teaching methodologies. In the state of Virginia, for instance, teachers must pass a mathematics content knowledge test and the Communication and Literacy Assessment while Texas teachers must take both a mathematics test and a Pedagogy and Professional responsibilities exam. The teacher must also pass a comprehensive background check. She can apply for a teaching license after all of these requirements have been met. Some states, such as Massachusetts and New York, require teachers to obtain a master's degree. Coursework for a master's degree includes mathematics classes such as statistical analysis, complex variables, number theory, algebra, geometry and problem solving. Teachers satisfy the education components by taking classes in curriculum and instruction, educational foundations and educational psychology. Graduate school programs usually require students to complete a practicum or thesis as part of the requirements for graduation. A teacher who is certified in another educational specialization and is interested in teaching mathematics can usually earn an additional certification by taking college-level coursework in the subject area, by passing one or more content-specific examinations, or both. 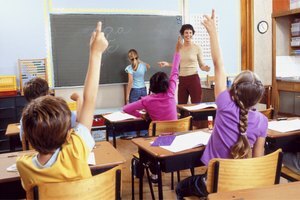 Every state has specific requirements for adding additional teaching areas. 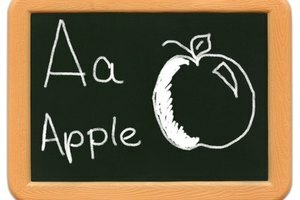 For example, a teacher in Virginia must take classes in geometry, computer science, algebra, statistics, probability, trigonometry, calculus, and discrete mathematics. She must also pass a teaching examination before she can add the certification to her license and teach in that field. A teacher in Texas, on the other hand, can add a certification by successfully passing the appropriate examinations. University of Georgia College of Education: Academic Programs - Mathematics Education, M.A. University of Georgia College of Education: Academic Programs - Mathematics Education, BS.Ed. 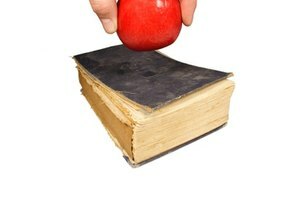 Masters in Education Guide: Why Do I Need a Master's in Education Degree? Elsworth, Stephany. "What Type of Education Do Math Teachers Need?" Synonym, https://classroom.synonym.com/type-education-math-teachers-need-6403.html. 26 September 2017.